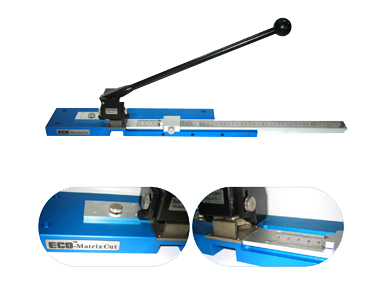 • The Eco-MatrixCut is a cutting instrument with solid base, user-friendly handle, measuring gauge, and a set of tempered steel cutting blades. • Special design cutting tool reduces waste. • Cleaning waste pieces through female tool. • Adjustable side gauge fitted for any size of creasing matrix. • Strong base designed for comfortable and maximum efficiency. • Min. cutting length 20mm. Max cutting length 35mm. • Capable of cutting all Cito PRO, Standard, Basic, Plast etc. • Min. cutting length : 15mm. • Solid aluminum-alloy construction, very light and smart. • Special designed cutting tool reduces waste, just 0.4mm waste. • Adjustable side gauge fitted for any size creasing matrix. • Accurately cutting tools ensure best cutting quality. • Ergonomically designed for comfortable and maximum efficiency. • The Eco-Matrix Cut is designed for the sole purpose of cutting desired length of creasing matrix used in the die-cutting and creasing of paper, cardboard and corrugated board. • The Eco-Matrix Cut is a manual device, and does not carry magnetic or electric requirements. 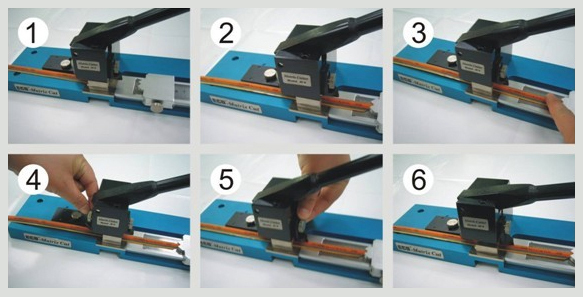 • The Eco-Matrix Cut is suitable for cutting different lengths of creasing matrix e.g. CITO; 0.4 x 1.0; 0.5 x 1.2 and each kind of specification/model of Fibre counterboard creasing matrix?except for Plast creasing matrix? • Specially tempered cutting tool. Waste can be reduced to only 1.6mm. • Clearing waste through female tool, which avoids blocking. 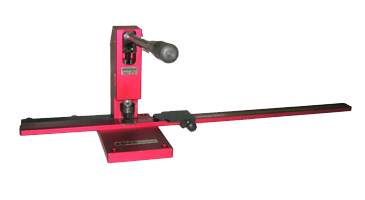 • Adjustable side gauge allowing cutting of all lengths size of creasing matrix. • Excellent cutting result. Creasing matrices are always cut to the right length by setting of the length stop. • Solid base designed for comfortable and maximum efficiency which enhances life time. • Special design of cutting tool avoids pressboard de-lamination. A centric 45 degree cut is guaranteed by a lateral stop and an additional simplification is reached by a guiding nib for the mounting locator. • Eco-Matrix Cut is a special device for cutting desired length of creasing matrix which assists higher efficiency of diecutting operation. • Through the use of Eco-Matrix Cut, it reduces machine downtime and saves production cost. • Eco-Matrix Cut is designed for the sole purpose of cutting desired length of creasing matrix used in the die-cutting and creasing of paper, cardboard and corrugated board. • Eco-Matrix Cut is a manual device, and does not carry magnetic or electric requirements. • Eco-Matrix Cut is suitable for cutting different lengths of creasing matrix e.g. CITO, 0.4 x 1.0; 0.5 x 1.2 and all kinds of specifications / models for pressboard & plastic materials creasing matrix. • Aluminum alloy design, light weight, flexible operation. • Unique specialized die-cutting tools, with waste just 0.4mm. • Adjustable gauge rule on the side and any size of creasing matrix. • Quality cutting tools guarantee the best cutting result. Special design of cutting tool avoids pressboard de-lamination. A centric 45 degree cut is guaranteed by a lateral stop and an additional simplification is reached by a guiding nib for the mounting locator. • User-friendly design, easy operation, and enhances work efficiency.